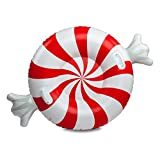 Whether you've just had a fresh snowfall on a nearby hill or you want to float around in the pool on a hot summer day, hop upon this cool new Peppermint Twist Candy Snow Tube. This festively refreshing inflatable snow tube is shaped like a gigantic old-fashioned peppermint twist candy. Just inflate, jump on, grab the built-in handles, and tear down the slopes in style.